There’s a new event to take place in Columbus, Ohio the Monday after Jungle Jim’s Weekend of Fire! In years past chileheads and fiery foods manufacturers have congregated at CaJohn’s Fiery Foods facilities, but this year we will all meet at the Cajun Island Restaurant in Columbus, approximately 100 miles northeast of Jungle Jim’s in Fairfield, Ohio. 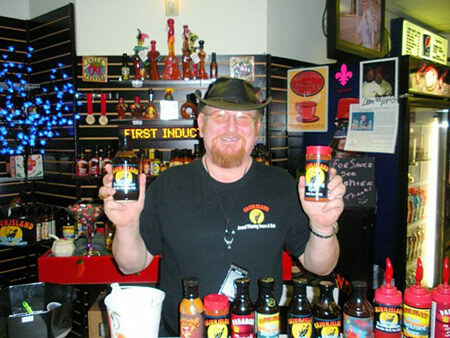 For those of you unfamiliar with it, the restaurant is owned by none other than Nick Ney of Cajun Island, and he makes some of the most delicious and addictive chicken blackening spices and sauces known to man. If you’ve attended the Weekend of Fire in years past, or perhaps another event around Ohio of the east coast, chances are good you’ve stopped by nick’s booth and sampled some of his fantastic eats. The chilehead get-together will be held at Nick’s Cajun Island Restaurant on Monday, October 8th from 11:00 am – 2:00pm, or until everyone goes home. It is located at 5732 Scarborough Boulevard, Columbus, OH, 43232, inside of the Market Place of the Americas. The main mall will be closed that day for Columbus Day, but the movie theater inside (plus the eateries, including Cajun Island) will be open, so everyone should come through the Cinema City entrance for access. Nick stated that there will be a full spread waiting for us. There may even be some card playing for an impromptu chilehead poker tournament or two. Everyone is welcome to attend! Come one, come all, bring your friends, spread the word, and hopefully this will be a fun time. I do ask that if you’re coming, please comment either here in this blog post or on one of the Facebook chileheads groups I posted this notification in. I may even create a Facebook event for this gathering. Bottom line is, if you’re attending the Weekend of Fire, if you’re a chilehead in central Ohio, or are one of the fiery foods manufacturers making their way back home back east after the show, stop on by and hang out! Hope to see you there.